Scarred from the war, both physically and emotionally, Basir Hamidi is grateful for a place to live. But his attraction to Meghan is a problem. With his honor destroyed by events in his homeland, and nothing to offer her but his broken, scarred self, he vows to avoid her and protect her reputation. Yet he is drawn to her with a strength that can only be God's leading. For a man who has lost everything, letting go of the past is a difficult process. 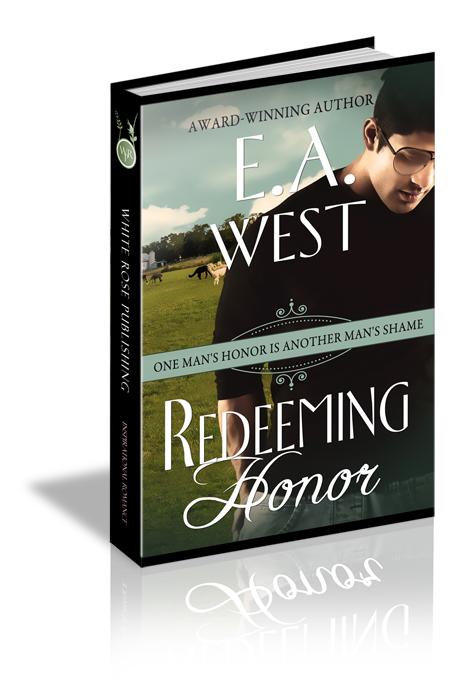 When he must also redeem his honor, his only chance of success is to rely on God. Meghan Carpenter glanced up from the spinning wheel as her twin brother stepped into her workshop, cellphone in hand. He dropped onto the wooden bench by the wall and watched her spin a few more inches of roving into worsted weight yarn. Ever since Ryan moved in after his discharge from the Marine Corps, he got quiet at odd moments or seemed fascinated by mundane things, such as her spinning yarn for about the millionth time. This time, however, she sensed he had something on his mind he wanted to share. “You want to bring him here?” The nudge in her heart encouraged her to go along with her brother’s plan, but she didn’t know which of the men he’d served with she would be taking in. Not all of them were men she trusted under her roof. He grabbed his cellphone and left the workshop as he dialed. Hopefully, his friend would have an easier time than her brother had adjusting to normal, boring life, but the way Ryan had spoken about him indicated he might be in worse shape. Thank You, Lord, for blessing me with patience. Meghan rose from her stool and headed into the main part of the house. If she was going to have another long-term houseguest arrive tomorrow, she needed to make sure the guestroom was ready. Fresh linens on the bed, maybe a friendly houseplant on the windowsill, and a quick dusting and vacuuming would take care of most of the preparations. She also needed to make sure the closet and dresser were empty. “Why the change?” She lowered her foot to the floor and faced him. Meghan stared at the door long after he closed it. Her brother left in a better mood than she’d seen in a long time. Could he need his friend to live with them as much as, if not more than, his friend needed a place to stay? She paused in the middle of scooping them into a bowl. Did Basir have any food preferences that would make her planned lunch a bad idea? Her gaze strayed to the refrigerator, where a bowl of ham cubes waited for her brother’s salad. Since Afghanistan was a Muslim country and Islam forbade the consumption of pork, would Basir mind her serving a pork product? Ryan had said he was a Christian, but she had no idea how much of the Islamic religious mores might have become part of Afghan culture. Too late now to change the lunch menu. She would just have to hope he overlooked any foods he couldn’t eat for cultural reasons and forgave her ignorance. At least she also had a bowl of smoked turkey cubes for the salads. Before she prepared supper, however, she would be sure to ask about any preferences or dietary restrictions Basir might have. She set the dishes of toppings on the table, along with a huge bowl of green salad. A sense of accomplishment filled her as she gazed at the lunch that had mostly come from her own property. She had grown the lettuces, carrots, peppers, cucumbers, onions, and tomatoes. The only ingredients she had bought were the dressing, meats, and cheeses. She had traded a neighbor produce for the eggs. The men entered as she poured the last glass of iced tea and placed it on the table. She set the pitcher on the counter and joined her brother and his friend at the table. “Looks good, Megs,” Ryan said as he settled into his seat. He indicated a chair to Basir, who then pulled it out and sat down. “Thanks.” She took a seat, noticing how easily her brother and his friend interacted. There were little things that indicated her brother must have learned quite a bit about Afghan culture, such as indicating Basir’s seat, but Basir also seemed comfortable in an American kitchen. Maybe it didn’t matter whether certain foods were taboo in Afghanistan. If he had been in the United States long enough to adapt to the American way of life, he might not stick to Afghan culture any longer. With that thought in mind, she decided to quit making assumptions about her new houseguest and treat him the same way she would treat anyone else. The three of them bowed their heads, and Ryan thanked God for the meal and Basir’s safe arrival. As they passed around the dishes, Meghan noticed Basir never used his left hand to touch the serving utensils, only his right hand. He also bypassed the ham, which didn’t mean much since she didn’t take any either. “Yes, I was an interpreter.” He shifted in his seat and glanced at Ryan. “Only about the way things are done in Afghanistan.” Basir dropped his gaze to his plate, apparently intent on studying the piece of cucumber he poked with his fork. “Is it because of your injuries?” Her heart went out to him at the thought he might not be able to do farm work because of getting wounded. If that was the case, she would find ways for him to help out that weren’t physically taxing. Ryan moved the conversation on to the farm and his work on it. Basir seemed comfortable with the topic of farming, but Meghan only half-listened to the men talk. How could she help Basir heal not only from his time working with the American military, but also from the loss of his family?